The Rivers State Police command says it has shot dead three gunmen suspected to have killed Nnafor Ogbu, the Ogale Eleme Youth President. Spokesman for the command, DSP Nnamdi Omoni, who confirmed the development in Port Harcourt on Monday, said that the gang on Sunday, broke into Ogbu’s house in Ogale, Eleme Local Government Area and shot him dead. According to him, Elijah Eleke, the DPO of the Area, quickly mobilised men of the Division in search of the hoodlums. Mr Omoni said the gang was intercepted at the refinery junction in Port Harcourt. The suspects immediately opened fire on the police. “In a return fire, three of them were fatally wounded and died before medical attention could be given, while others escaped,” he said. He added that the four corpses had been evacuated and deposited in a mortuary. Mr Omoni said one locally made double barrel gun and 11 live cartridges were recovered from the suspects. The spokesman said investigations into the matter had commenced, assuring that the fleeing members of the gang would be arrested and brought to justice. 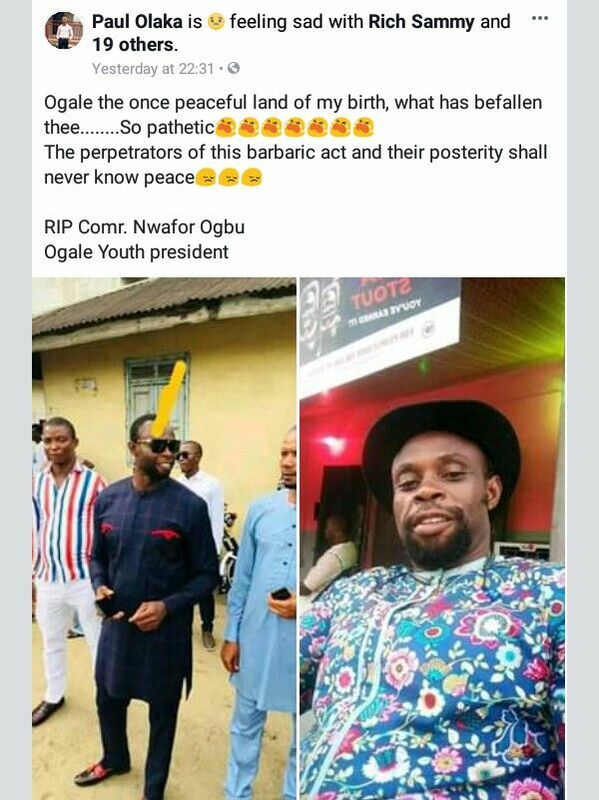 Meanwhile the late Ogbu’s friends have taken to Facebook to mourn him.